Last week we reported we expected sales to be roughly even if not slightly behind 2010 levels when official numbers were reported. Well, its official and we were wrong. Sales actually increased by 25 sales over last year. Single family home sales were reported as 1127 sales versus 1102 last year. We also reported listing inventory actually went up slightly by 43 units which was another change in direction. It turns out the sales weren’t a change in direction, but it doesn’t matter. Whether they were up or down 25 units statistically it’s not a big difference. What was interesting was the first change in direction, and something we wanted to monitor going forward. While we’re usually correct with our predictions, this time we were off on the sales numbers. There was another bit of good news in the official numbers. Not only were sales up, but prices rose 17.6% over last year and 7.17% from the previous month. This could be because home affordability is at an all-time high and buyers today can afford more home due to lower prices and lower interest rates than ever before, or it could be because there was less distressed this past month. In fact, in September 50.77% of all single family home sales were distressed, down from 54.26% in August. Those numbers were as low as 44.57% in June of 2011. Banks have not brought significant foreclosed inventory to the market since the robo-signing fiasco, although we’re being told this may change in January as several of the large banks are able to bring more as they’ve worked through legal issues pertaining to those questionable foreclosures. 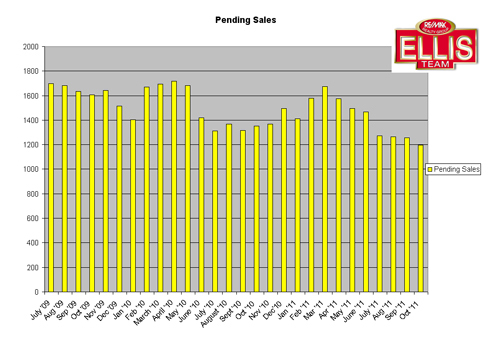 Pending sales were down last week, so we’ll have to see how this affects sales going forward, however they are typically down this time of year and start picking back up again going forward. There is some seasonality in these numbers we like to account for, and this year is no exception. We have noticed our roads are getting busier and our northern friends, sometimes referred to as snowbirds, have begun their trek to SW Florida, and judging by our phone calls and Internet leads, many are in search of their piece of paradise. 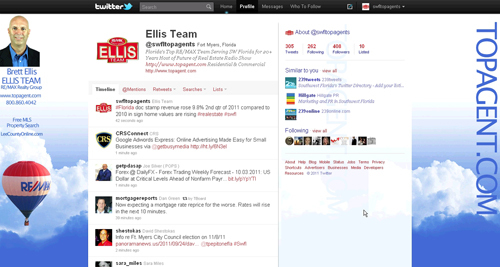 This could bode well for another strong season in the SW Florida real estate market. Two new programs were just announced that will greatly benefit distressed homeowners. One program allows underwater sellers to refinance their home no matter how much is owed if it is a FNMA or Freddie Mac insured loan as long as they’ve been current on their mortgage in the last 6 months, and another program that offers sellers up to $20,000-$30,000 in financial assistance to move and sell their home for less than what is owed. We’ll bring more information to you about these two new programs in the coming weeks. If you’re a homeowner and struggling to make your payments, you might be interested in either of these programs. Simple give us a call at 239-489-4042 or email me at Brett@topagent.com feel free to visit our website www.Topagent.com for other timely information and links to our videos. 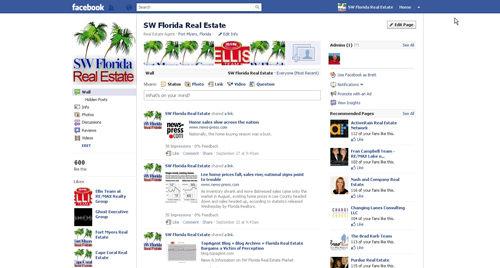 We like to include charts to illustrate latest trends in the SW Florida real estate market. For years we’ve tracked numbers and reported the upside and the downward trends in the market. For the past year or more all market trends have been to the upside. 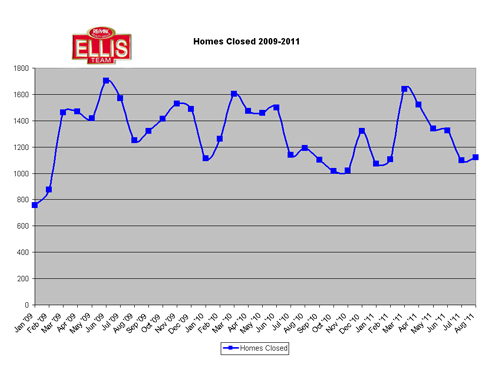 Preliminary numbers gathered by the Ellis Team indicate single family home listing inventory in Lee County went up for the first time since January 2011. Granted, back in January single family home inventory was 34.54% higher than it is today, but this past month is the first time we’ve seen inventory rise in months. Listing inventory only rose 43 units which accounts for about .5%, so it’s not an alarming trend, just a slight change in direction we’ll keep our eye on. Due to space constraints we didn’t include that chart; however we’d like to draw your attention to the SW Florida Sales Chart and the Pending Sales Chart. Both these charts support findings in the inventory levels. 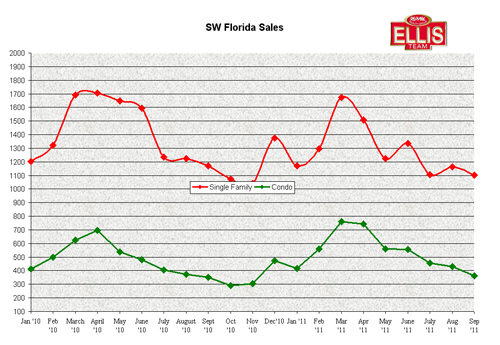 Sales in SW Florida have been falling since March which isn’t out of the ordinary the past several years. 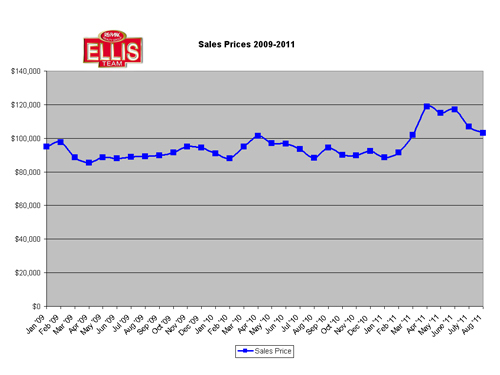 What’s interesting is that September 2011 sales are slightly behind 2010 levels, but not by much. Again, it’s the direction of the change, not the actual numbers we’re looking at. Pending sales have also fallen since March. 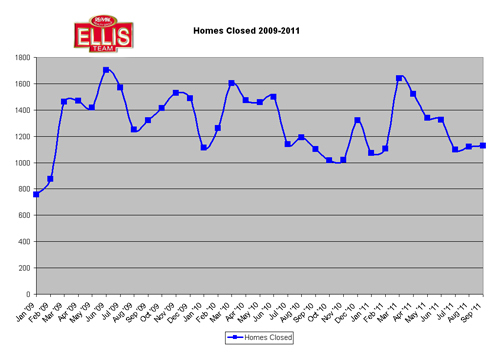 This confirms that pending sales are an accurate indicator of future closings. While it makes perfect sense, sometimes in life what appears to make sense doesn’t always match reality, but in this case it does match. For months inventory levels have gone down and many have speculated that’s the cause of decreased sales. We think there is a lot of truth in that. Listing inventory just went up this past month, so does that mean sales will go up? When official numbers are released next week we don’t think so. We think they’ll mirror what we’ve been reporting and will be down slightly from the previous month. So if inventory has been a legitimate reason sales have fallen, why wouldn’t the increase signify increasing sales going forward? The answer is it could, but there are other factors. We must look at the mix of inventory as well as other factors. The mix refers to traditional sales versus foreclosed homes and short sales. Not all short sales close, and their timing is anything but predictable. Foreclosure inventory looks to rise some in the 4th qtr of this year and more in the 1st qtr of next year. If this bears out, sales will almost assuredly be influenced by the exact number hitting the market as there is a large appetite for foreclosed bargains. Other wild cards influencing the market are the availability of credit. Banks are requiring buyers to jump through more hoops and regulations than ever. The new Dodd Frank Act is making it more difficult to close even approved loans. Regulations have become burdensome and making it impossible to meet certain deadlines. We always say time is of the essence in our contracts, but that’s not the case as Congress has changed so many regulations for the worse. There are waiting periods for HUD closings statements to be approved, so if there is any little change, all prorations of fees may need to be re-approved. If a buyer selects a different rate or program, the bank must re-disclose everything and a new waiting period begins. This makes it difficult to meet certain deadlines in short sales, and many times that property is foreclosed instead of a successful sale because Congress saw fit to add additional layers and slow everything down. Congress always has good intentions, but they don’t use their head. Loans take hours to underwrite now and certain loans banks don’t even want to mess with because of the new regulations. This hurts certain segments of the market. I hear almost everyday complaints from loan officers on how tough their industry is. Of course, lending affects our industry, and real estate affects the economy. Sometimes I wish Washington DC would listen to people in business and get out of the way. We’d all be better off if they regulated less and let business do business. That’s the way to create tax revenues. People are surprised to learn fixed interest rates are at or below 4% for 30 yr mortgages. Because of this there has been a refinance boom which should throw some disposable income back into the economy. It did the last time we had a refinance boom. Not everyone can take advantage of this bonanza though as some are upside down on their mortgage. Owners might be happy to know there is a government program that allows homeowners to refinance even if their first mortgage is up to 120% of current value, and if you have a second mortgage or equity line it can be subordinated to the 1st. All good news if your rate is 6% or higher. It’s possible good news even if your rate is in the 5%+ range depending on the home value. Check with your lender for details. Getting back to the main subject of this article, buyers today can now afford more home than ever before. The reason is simple. A home’s cost has several elements, and the two primary elements are sales price and financing costs. As you can see from the year end sales prices our median home values have dropped dramatically and at the end of 2010 year end average prices were approximately even with 1997 prices. Everyone rushed to buy in 2005 when in fact they should be rushing today. 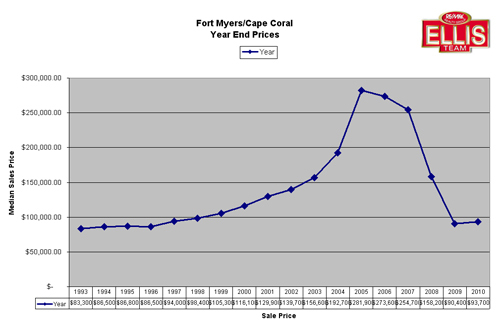 Prices have moved upward a bit and when year end prices are posted for 2011 they will show an upward trend. Bottom line is they’re still a far cry from the peak in 2005. Look at the average 30 yr interest rate chart. Back in October 2006 rates were approximately 6.36%. Today rates are around 4%. That’s a difference of about 2.36%. A $200,000 mortgage this year would be roughly $300 cheaper than it was 5 years ago. This fact alone makes housing much more affordable. Combining the lowest rates we’ve seen on record with deep price reductions in our market, it’s no wonder why this is the best time in years to purchase a property. Much thanks to Keith Cloak from Summit Home Mortgage for pointing out these historical rates to me. The nation’s economy has been stalled for years. Locally our market was hit first, and hard. Because of that our market may be poised to recover sooner. Tourism may get a shot in the arm if the proposed $1 Billion casino is approved at the Forum. This would put Florida on the map for additional tourism and the all important convention and trade show business. We would have our gorgeous Sanibel and Fort Myers beaches, year round sunshine, and now convention business attracting tourism to our area. I spoke to Lee County sheriff Mike Scott the other day about his thoughts on the casino. Those against bringing gambling to Florida argue it brings crime and detracts from the family atmosphere Florida is known for. Sheriff Scott doesn’t believe a casino would bring crime from a law enforcement standpoint. Judging from my visits to Las Vegas or a seminar I attended in AZ at a casino on an Indian reservation, I don’t necessarily buy into increased crime either. I do see this as an opportunity to add $1 Billion in construction at a time when our area desperately needs it. I also realize we have gambling in Florida at Indian reservations, so I wonder why the state can’t capture some of that revenue too. Lord knows our state needs the revenue as well. Primarily I think about what increased tourism, conventions, trade shows, and visitors who might extend their stay a few days because Florida has so much more to offer than Las Vegas. Vegas has gambling, but we have beaches, Disney, water sports, nature, and so much more. I can envision vacationers choosing to come here instead of Vegas or Gulf Port MS, or even places like Branson MO. With housing affordability in SW Florida at all time highs, home prices on the rise which will settle people who may be afraid if now is the time to buy, and a possible economic jolt to our economy, it sure is exciting to live in SW Florida. Check out what Fort Myers Beach and Sanibel Island have to offer you. Social media has been the buzz words the past few years and it seems everyone has tried to capitalize and make money from the latest craze. For those that understand its value and proper use, social media can be very rewarding. For those that make freshmen mistakes, the cost can be lost customers and countless hours of wasted time. The benefits are clear. If done properly, consumers may flock to your content, or you may find yourself interacting at deeper levels with your customers and finding out more about them than you ever would have face to face. Social media opens up a new world where people sometimes feel safer sharing inner feelings and facts about themselves than they do in real life. Connecting with customers is all about getting to the heart level and learning what’s important to them. You’ve probably heard the old saying, “Treat others as you’d like to be treated.” At the Ellis Team we like to use the Platinum standard which is “Treat others as they’d like to be treated.” We study personality profiles and adapt our communication based upon the way our customers like to communicate. Not every personality profile is the same. Some personalities are bubbly outgoing social beings that have never met a stranger and are certainly the life of every party. Another is the calculated detailed oriented person who must know all the facts before making a decision. There is also the family oriented person that could talk children and family all night, as well as the dominant director type that makes quick decisions and is in charge. Knowing who our customers are helps us to interact with them on their level. The director type turns off with hours of facts and needless chatter, while the engineer, detailed oriented person would never make a decision without studying it from many angles. Social media helps us to understand our customers and deliver information on many levels. We also engage our customers. We teach our team that if you can get a person to talk about (FORD) Family, Occupation, Recreation, Dreams you will connect at a deeper level and become friends with everyone you meet. Many of our customers are friends because we care about them as a person, not just a transaction. Apply FORD to Facebook. In just a few minutes you may find out about someone’s niece or nephew, their child’s soccer game. You might also find out their new relationship status, how happy they are in their job, what they did on vacation, how their sports team is doing, etc. You can hit all 4 FORD items quickly. Social media is an opportunity to engage. So the next time you jump online and into a social media platform, think about more than just posting random thoughts. Use it as a tool to elicit responses, get people talking, and learning more about others. When you learn and care about others, you become more attractive as a friend or resource, and people will enjoy telling you everything, and maybe even doing a little business with you. And if not, at least you’ll make some true friends. Good luck and happy communicating. We’ve included a few of our public social media pages in case you’d like to get some ideas. And maybe we’ll become friends too. Official sales numbers were released this past week by Florida Realtors and as expected median sales prices fell 3.46% from July as more distressed sales sold in August 2011 than July. 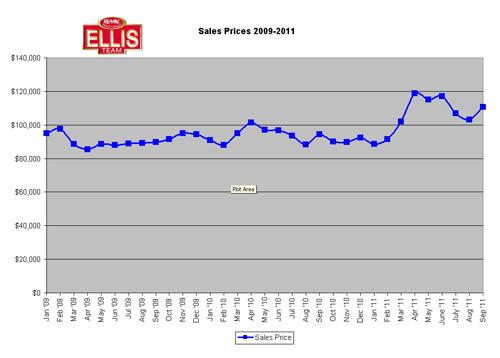 Sale prices were up 16.74% from August 2010 which is positive. Listing inventory continues to slide which bolsters prices as well. Last year Lee County had 11,667 combined single family homes from all MLS’s on the market and today we’re down to 7,675 combined. Actually there are less than both numbers because some homes are listed in multiple MLS’s, especially high end homes or homes in Estero, Bonita, San Carlos park where Realtors may belong to more than one MLS and desire additional exposure. Sanibel and Captiva is another example of where agents might list homes in the Sanibel board and the Fort Myers board. As you can see from the attached charts, even though inventory has been falling, Realtors have been successful at closing high numbers of homes even though many are short sales. This is a testament to the fact buyers are being forced to look at short sales which may take longer to close to find homes in their price range. It is also testament that Realtors are increasing their education to handle these complicated sales, and banks are gearing up to close more of these sales rather than selling through foreclosure. While sales prices have declined from their 2011 seasonal highs, they are still significantly higher than last year’s numbers signifying the bottom may be behind us. Before our market reaches for the skies again, we must first repair our fragile economy and create jobs and income growth. Combining that with a coherent, understandable, and definite tax policy will also help settle the real estate market. Congress and presidential politicians keep proposing changes to mortgage deductions, increased capital gains taxes on certain groups of people, and worst of all they’ve failed to extend the National Flood Insurance Program which puts hundreds of thousands of current transactions in jeopardy. Washington couldn’t script are more harmful strategy to disrupt housing, which is amazing as housing leads to 32% of the nations GDP. There has got to be a better way, and thankfully there is a better way, but it won’t happen until the next election. So for the next year the nation’s economy and housing market will have its ups and downs and will take its lumps until certainty returns to the market. I never understood why the president proposes raising taxes on certain people and not others. While I’m certainly not rich, nor is any real estate agent I know in SW Florida, I just don’t understand how taxing those that make more money encourages them to work harder or hire more people, which is what our economy really needs right now. Last week I wasn’t paying attention and I received a speeding ticket. A day later I thought. Hey, if certain people get to pay more taxes because they earn more, then why can’t certain people drive faster than others? If I’m paying more shouldn’t I be allowed to drive faster? Well, it’s a silly argument as we should all obey and drive by the same rules, and so it goes with taxes, we should all pay the same rates. If someone makes more, they automatically pay more. So why should they pay more, and pay a higher rate? And when companies are taxed at one of the highest rates in the world, why do we wonder when they move operations overseas? Perhaps we should lower taxes and encourage them to come back and hire US workers, which would raise income to the government. Have you ever wondered why certain corporations move to Delaware or South Dakota? It’s because those states learned to compete with other states they must have lower taxes. It’s about time our Federal government understood this. We are in a global competition. When someone can accurately predict when our government will get its act together, almost anyone will be able to predict the real estate market. Until then, we’ll keep reading the tea leaves and reporting what we see.